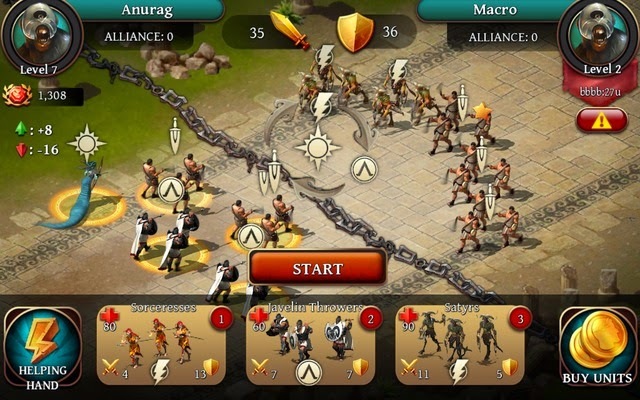 Age of Sparta (AoS) is a base-building RTS with a split-screen combat system. You might be familiar with this mechanic if you have played games like Empires & Allies and World at Arms (another great strategy game by Gameloft). However, AoS brings additional features to it and makes gameplay more enjoyable. 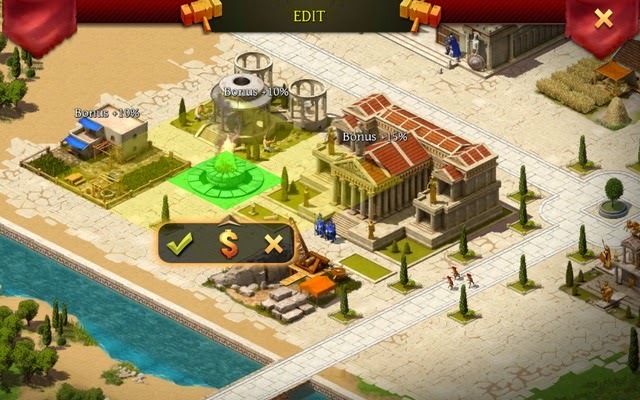 Age of Sparta borrows some gameplay elements from Clash of Clans. These include Invading enemy territory and looting resources. How you manage your troops, build structures and expand your territory depends on the resources you have. You can earn them by winning campaign and PvP battles. When placing units at the field of war, have the strongest units on the front row slots. Inspect them and place those that have high HP (Red Plus Sign), Attack and Defense rate. I prefer placing units that have high ATK and HP on the front row slots. Other factors such as traps, bombs and incoming special attacks play a key role in battle, but having the strongest units in the front line can be a battle-winner. Always give first preference to high HP units. Ignore those that have HP less than 60. Ignore the rock-paper-scissors mechanics in this game. Having a stronger unit type opposite a weaker enemy unit type does give you an attack bonus, but your troops can be easily defeated if the weaker unit’s HP, ATK and Def stats are higher. Keep an eye on health chests, poison bombs and projectiles on the battlefield. Swipe incoming projectiles to avoid damage to your troops. Items on the enemy’s side, the ones with a red glow, can do immense damage to enemies. These items include bombs and boxes that emit poisonous fumes. Tap on these items when the enemy comes closer to them. Green glowing items are health potions that can heal your troops. Tap on a green glowing box when your units approach it. Tap on a charged unit to inflict max damage to enemies. Be quick, else the charge will fizzle out in a few seconds. The best way to earn bonus coins is to place boosters near revenue-generating buildings. A proper strategy would be to place 2-3 “Income” buildings on one single plot of land and place a booster somewhere near or in the middle if possible. You may use the “Edit” option in the tools menu to move buildings and make way for the booster building. Use the edit tool to remove or sell any trees that act as obstacles. Buildings placed near a booster will provide additional revenue. You can also place one near “Faith” and “Population” buildings to boost energy production and workers. Boosters can be accessed via Tools > Shop. They usually provide a bonus of 1-75 percent. Purchase boosters that require coins as it is not easy to earn gems. Your units will be killed in PvP and campaign mode battles. Keep a check on the current number of troops by tapping on Grounds of Ares > Stash. Win or lose, don’t play another session of battle in the campaign mode. Go back to your base, check how many units you have and if the number is less, train more. Your leveled-up units can also be killed in action. So you may need to train a bunch of same-type units and fuse them together to get stronger units. Once you are ready with your units, you can continue with your battle campaign. In Age of Sparta, you can evolve your basic units into powerful warriors with the help of “Fusion”. Before fusing, train 2 units of the same type. 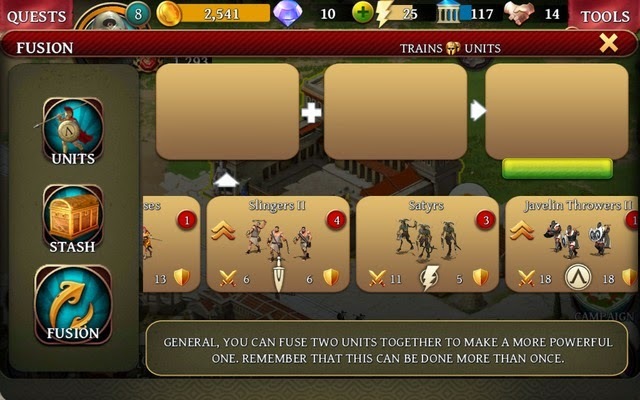 Tap on a military building (Grounds of Ares) and select a troop that you want to train. You will need to spend coins for each training session. It will take around 20 seconds to train a unit. Repeat the training session for the same unit. Now you have two units of the same type. To check the number of units of the same type, go to Tools > Stash > Units. Once you have created two units of the same type, just tap on “Fusion”. On the Fusion screen, you will see different unit types. The number on the top-right corner shows how many units you have trained. Example: The number 2 on the top-right corner of Slingers shows that there are 2 units of the same type. Now tap on the Slingers icon twice to add them to the empty slots above and press the green button. You will have to spend coins to complete the fusion procedure. You now have Level II Slingers. Try and experiment with the Fusion process. You can combine two level II Slingers to create level III units. Income buildings such as wheat farm, vineyard and tavern generate revenue, which can be used to train soldiers, purchase buildings and boosters. Don’t forget to tap on income buildings whenever you see a coin icon above them. Always have 2-3 income buildings of the same type to increase revenue. Don’t forget to place boosters close to these buildings for bonus coins. Your headquarters is also a good source of revenue, but it will take time to generate a substantial amount of gold. You don’t have to wait that longer. Just tap on your headquarters and tap on “collect” after 10-15 minutes to get 300-400 coins. If you have patience, then wait for an hour or two to get more than 1K coins. 1. There are different types of military buildings. Some are training grounds to recruit and train foot soldiers and air units, whereas others provide ”Gods” or hero units. There are some buildings that train soldiers at a reduced price i.e. soldiers are train by spending fewer coins. 2. Faith Buildings generate “energy”, which is used in battles. You will need energy if you want to fight PvP and campaign battles. Energy can also be used to purchase buildings like the Sanctuary of Gods. Build more Faith buildings and place them near boosters to increase energy collection. 3. Completing quests and constructing buildings generate XP, which can help you level up your avatar. You can also earn XP by battling enemies in the campaign and PvP mode. Leveling up unlocks additional buildings and troops. So complete quests, build structures, participate in PvP battles and story mode, defeat enemies and earn more XP. 4. Earn Social currency (handshake icon) by defeating human players in PvP battles. You can use it to purchase elite troops like Gorgons. Elite troops are special troops that are stronger than basic units. You can’t purchase them with gold coins. 5. A win against a human opponent lets you invade and steal their resources. These resources can be anything from income buildings to enemy HQ. If it’s an income building, then choose the one that provides more gold. 6. Having God units alongside regular units boosts their attack and defense stats by 25 percent. To have a God unit by your side, build a Sanctuary of Gods (Requires Faith). How do you re-fill troops hit points? I don’t think there is any way to refill troop HP. I may be wrong, but I couldn’t find any. You can train more if you have lost units. According to the game all troops have a + sign, which is the health value. It represents their life. Your troops lose some health value or HP after each battle. When their health value hits 0, the troop falls. You can resurrect them using gems. But sometimes the troop health will be 0 and still they don’t fall, thus showing a big chance of survival. In any case, once a troop falls (it will have a skull icon on it), you will have to train the same troop again.